One of the most known and appreciated Romanian directors of photography will challenge your perception about shape, color and light, during the three meetings of the masterclass. When we talk about visual arts, whether it’s photography, painting, film or sculpture, we first think of the instruments that help these gain expression. Therefore shape, color or light become essential elements in any type of artistic manifestation. Light and its close and indispensable associate, shadow, represented as a dual concept of both creator of depth and emotional expression, are the determinant factors for any type of visual expression. As a a creator of shape in itself, light is the primordial instrument through which depth is built and is part of the emotional foundation of any artistic creation, no matter its certified value. Marius Panduru proposes a short introduction in the complex history of visual arts from the perspective of light, as a creator of meaning. He believes that “whether we come from a creative professional environment or we are just conscious consumers of art, understanding the means through which we can build a powerful image can become an adventure of the mind and soul that is essential to all of us. 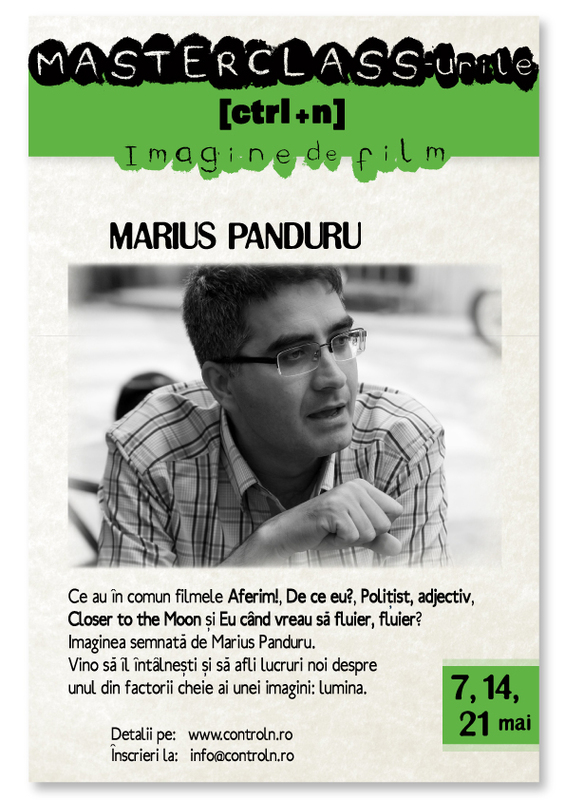 Throughout the three meetings with cinematographer Marius Panduru several themes will be discussed: painting and the influence of style on the image in cinema, how you can build an expressive world starting with the written words in a script, the importance of a unitary visual concept. All these will be discussed in an interactive and attractive mode, with a lot of visual examples. Throughout the meetings, Marius Panduru will also demonstrate, in a hands-on workshop, the way the expressive factor in a portrait changes together with the light. An actual scene will also be shot, in a simplified manner, but using different light concepts and thus defining the expressive nature of the scene. He graduated from the National University of Theatre and Film (UNATC), cinematography departement, in 2001. Until now he has signed the cinematography of 18 feature films, 20 short films and numerous advertising campaigns. He has worked, among others, with directors Radu Jude, Nae Caranfil, Corneliu Porumboiu, Florin Șerban, Cătălin Mitulescu, Tudor Giurgiu and Stere Gulea. His films have been selected in numerous international film festivals such as: Berlinale – Aferim! (Silver Bear for Best Director), Why me? (screened in Panoramal), When I want to whistle, I whistle (Silver Bear – Grand Jury Prize and Alfred Bauer Trophy), The Happiest Girl in the World ( CICAE Award in Focus); Cannes Film FestivalL Loverboy (screened in Un Certain Regard), Police, adjective (Un Certain Regard Award and FIPRESCI Award), How I spent the end of the world (screened in Un Certain Regard), 2:18 East of Bucharest (Camera D’Or and CICAE Award); Locarno Film Festival – Periferic and The Rest is Silence; Sundance – Tube with a Hat (Best International Short Film). On a national level, Marius Panduru has won The Gopo Award for best Cinematography 6 times for the films: Closer to the moon (directed by Nae Caranfil), Loverboy (directed by Cătălin Mitulescu), Police, adjective (direcred by Corneliu Porumboiu), The Rest is Silence (directed by Nae Caranfil), 2:18 East of Bucharest (directed by Corneliu Porumboiu) and Ryna (directed by Ruxandra Zenide). The three meetings of the masterclass will take place: May 7, 14, 212015.